The origin of the Great Dane has always been a controversial subject. Most of the credit is given to Germany, as they were basically responsible for the Great Dane as we know it today. History has proven that Dane-type dogs existed in Russia, Poland and middle Germany. In the middle ages large packs of wild boar roamed the European forests and it is well known that Royalty of the day formed packs of these large dogs similar to Great Danes and they became known as Boar Hounds, due to their capability of pulling the boar to ground. 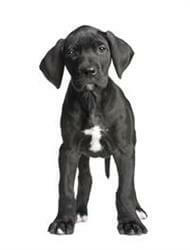 Over the generations, the Great Dane's nature has changed to the present day type that is known as the ‘gentle giant’. The Average lifespan for the Great Dane is 9 to ten years of age.